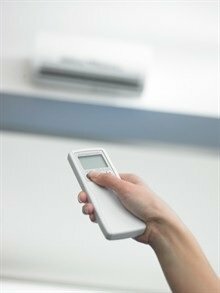 Ductless air conditioners are becoming more popular in the St Louis area for both residential and commercial customers. Hoffmann Brothers offers ductless air conditioning systems by the industry’s leading manufacturers, Mitsubishi and Daikin. The ductless technology is one of the most efficient air conditioning systems available. Hoffmann Brothers was one of the first St Louis area Contractors to install these ductless air conditioning systems in both St Louis businesses and homes. To find out more about ductless heating and air conditioning systems, request a bid or call us at 314-664-3011. Ductless air conditioners give you the freedom to control the comfort of each and every room. You can set the temperature as you wish for each room separately to make those in that room more comfortable. And because you have the power to turn off the unit in each room while not in use, they are one of, if not the most, efficient HVAC systems out there. 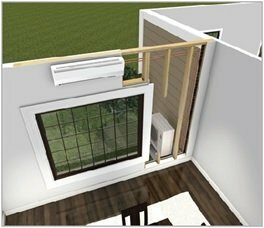 The Indoor unit: Each room on a ductless system, will have its own indoor unit, whether mounted on a wall or ceiling. These units are controlled by each room’s individual remote. The Outdoor Unit:There is only one outdoor unit that is linked to all the indoor units. So no need for multiple outdoor systems for each one, the refrigerant and wiring can be connected to only one outdoor system. The Remote Controller: You can set the temperature with just a touch of a button. You can set it to cool, heat, dry or auto. You can even adjust the fan speed and the direction in which you want the unit to blow the air. Ductless HVAC systems are quiet and one of the most efficient air conditioners on the market.Ductless air conditioners can be used in so many different applications in your St Louis or Metro East home. If you are putting an addition on the home, or if you want to heat and cool a sunroom, or if your 2nd and 3rd floors are not getting the proper airflow, then a ductless heating and cooling system is a great option for you. Ductless heating and cooling can be used within in the whole home as well as an alternative to ducted systems. To get more information, call (314) 664-3011 or request a bid here.